I grew up in an era of church socials and covered dish dinners. Whenever there was such an event, all the church ladies prepared their best dishes, casseroles, and desserts, filling the tables to capacity. Without fail, there was enough food to feed an army. The spread always included fried chicken, casseroles of every variety, and an array of cakes and pies. At some point, every church in town published a cookbook, featuring their members’ recipes. When I was a child, casseroles and one-dish dinners came into vogue. Food prep was all about convenience. Processed food, frozen dinners, canned vegetables, and boxed meals grew in popularity and cooking from scratch faded into a thing of the past. The pace of life was getting faster and faster, and anything that made food preparation easier became a way of life. Chicken Spaghetti stands out in my mind as one of those one-pot meals from my youth. Technically, it’s a pasta dish, but I’ve always considered it to be more of a casserole. My brother makes a delicious variation of this dish that takes me back to my roots. I always eat seconds and thirds whenever he serves it. The typical recipe contains Velveeta cheese, canned vegetables, and canned mushroom soup. 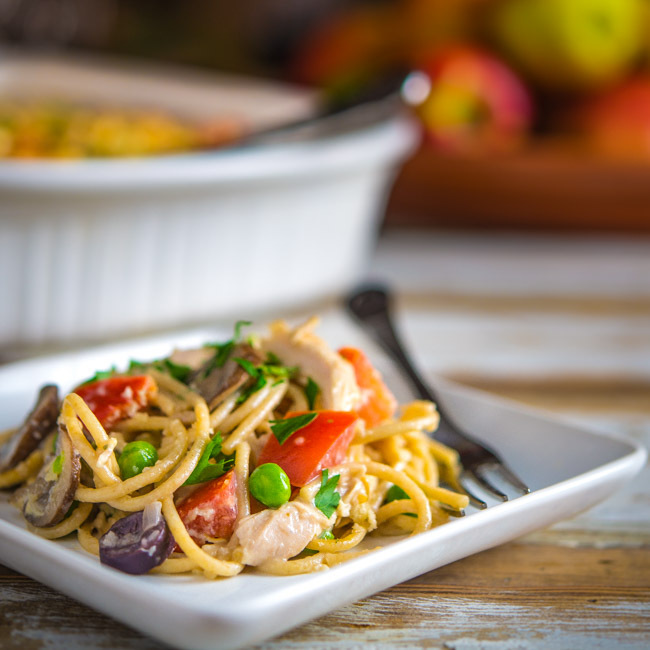 For today’s post, I decided to do a Chicken Spaghetti makeover with all fresh ingredients. This recipe makes enough for a large crowd, or if you’re feeding fewer people, it freezes well for use at a later date. You can also halve the recipe if you want a smaller amount. Give this makeover recipe of a retro casserole a try for a hearty and filling winter meal. 1. Fill a large pot with water and add 2 teaspoons salt. Transfer chicken to pot and bring to a boil. Reduce heat, cover, and simmer for 45 minutes. Remove chicken from pot, leaving pot with stock for cooking spaghetti. When chicken is cooled, debone and shred chicken into bite-sized pieces. 2. Preheat oven on broil mode. Place red, green, and jalapeño peppers on a baking sheet. Place peppers under broiler. Broil for 3 to 4 minutes and turn peppers. Repeat until pepper skins are blackened on all sides. Remove from oven. When cooled, remove skins and seeds and roughly chop. Set oven to bake mode at 375 degrees. 3. In a large skillet, melt butter over medium high heat. Add onion and garlic and saute for 3 to 4 minutes until slightly browning. Add mushrooms and continue sauteing for 3 to 4 minutes. Reduce heat, add flour, and stir until incorporated. Gradually add milk, whisking constantly. Add 1/2 teaspoon salt and pepper. Simmer until sauce begins to thicken. Add cheese and whisk until melted. Remove from heat. 4. Bring chicken stock back to a boil. Add spaghetti and cook for 9 to 10 minutes. Drain spaghetti, retaining chicken stock. 5. Transfer spaghetti to a large bowl. Add reserved chicken, tomatoes, olives, green peas, reserved chicken stock, sage, thyme, and parsley. Pour cheese sauce over other ingredients and mix well. 6. Transfer mixture to two baking dishes. Top with panko bread crumbs and bake for 15 to 20 minutes until warm and bread crumbs are browning. Bill – your photos are incredible! They make me wanna eats spaghetti – even though it’s not one of my favs! I am glad you opted not to use Velveeta cheese in this mouthwatering dish! Happy New Year!!! I grew up in the south where chicken spaghetti was king too. Yours is the prettiest and most colorful chicken spaghetti I’ve ever laid my eyes on. As I recall, chicken spaghetti was Craig Claibourne’s mother’s most famous recipe. Happy New Year Bill. Thank you so much, Sam! I’m glad to know a piece of the Chicken Spaghetti history! I hope you and your family have a wonderful 2015! I love one-pot meals, they always turn out to be the most delicious of dinners. This chicken spaghetti looks incredible – and I am SO craving a bowlful right now! Thank you, Thalia! I appreciate your comment and I hope you have a great New Year! Awesome makeover, Bill! I love these comfort-food classics but always shun them because of cream-of-whatevs soup (plus VELVEETA — shudder). Definitely going to be pinning this all over the place! Thanks, Jules! It’s definitely better than the processed version! Happy New Year!! Bravo, for getting rid of canned soups and processed foods. That’s what I strive for, because I grew up in the era when “Shake ‘N Bake” was new (and a novelty) and as kids, we delighted in eating Swanson’s TV dinners. I don’t eat that way any longer. But, if I can find a way to bring back those flavors with healthier fare— I’m all for it. This looks fantastic, healthy and flavorful. Happy New Year, Bill. It’s been a joy getting to know you and I”m loving your food blog tremendously. Thank you so much, Debby! It’s been great getting to know you too! I hope you have a fantastic 2015 and keep up the great work on your blog! This is another recipe hit! I love it. Pinned!